If you can be bothered going back through the Fine Art archives, you'll see that artists either currently or formerly employed at Ubisoft make up a disproportionate number of those showcased. The simple explanation for that is that Ubisoft hires a lot of talented artists, but there's a little more to it than that. For one, the company has its own large concept art teams, a duty that other publishers and developers often hand off to external studios these days. It also, unlike many other publishers, allows its artists to share the work they've done on completed games. Sounds trivial, I know, but you'd be shocked how many companies keep old concept art locked away as though a beautiful landscape painting was a corporate asset in anything but name. Which brings us today to Raphael Lacoste, a veteran artist of the video game business who has also dabbled in big Hollywood pictures. Beginning his career at Ubisoft in 2002, he's since worked for companies like EA and New Line Cinema, before returning to Ubisoft where he's presently the Art Director for the entire Assassin's Creed franchise. 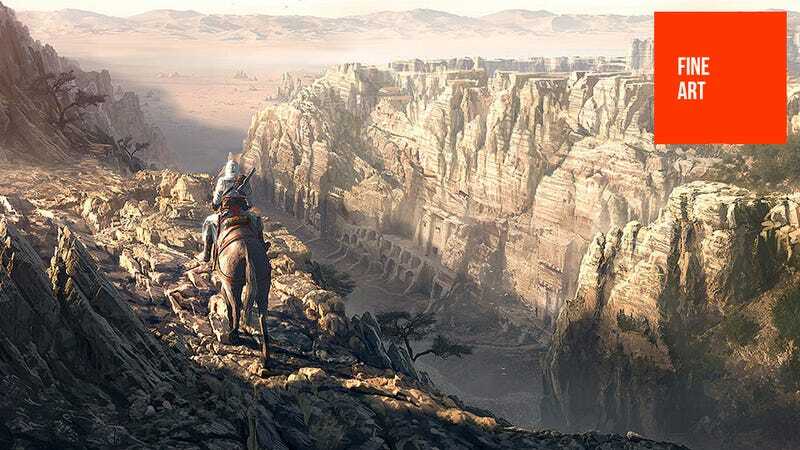 I know, I know, the image up top isn't actually set in the West (it's nowhere near the Americas, even), but the man on horseback, the desert, the canyons...a man can dream of Red Dead Redemption with Assassin's Creed's melee combat, can't he? If you like what you see here, there's more of Raphael's brilliant art on his personal site and his CGHub gallery.